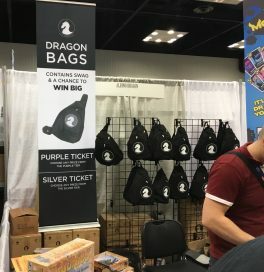 The Gencon 2017 vendor report continues! 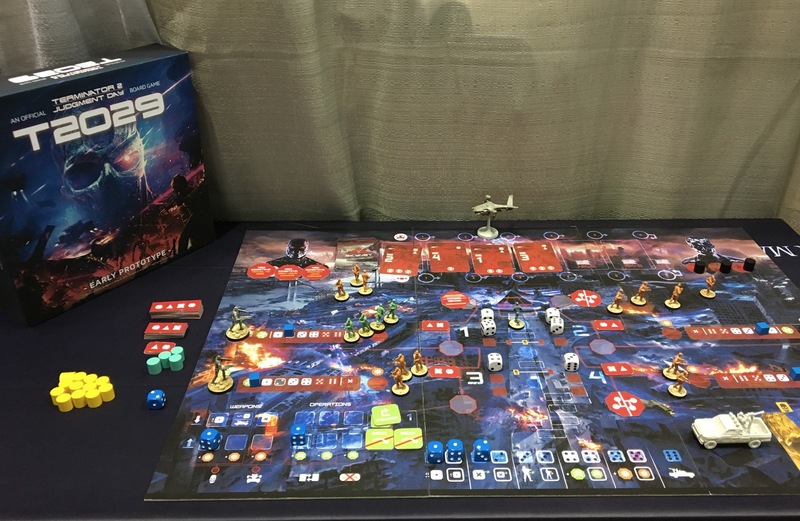 “T2029” is a new board game from the Australian company “Rule & Make.” The premise is players work cooperatively to hack Skynet and get John Connor to the temporal displacement equipment that puts the “Terminator” series in motion. They had a prototype board on display. Though there are dice on the board, you do not roll them. They are just placeholders for resources and you assign them as needed. 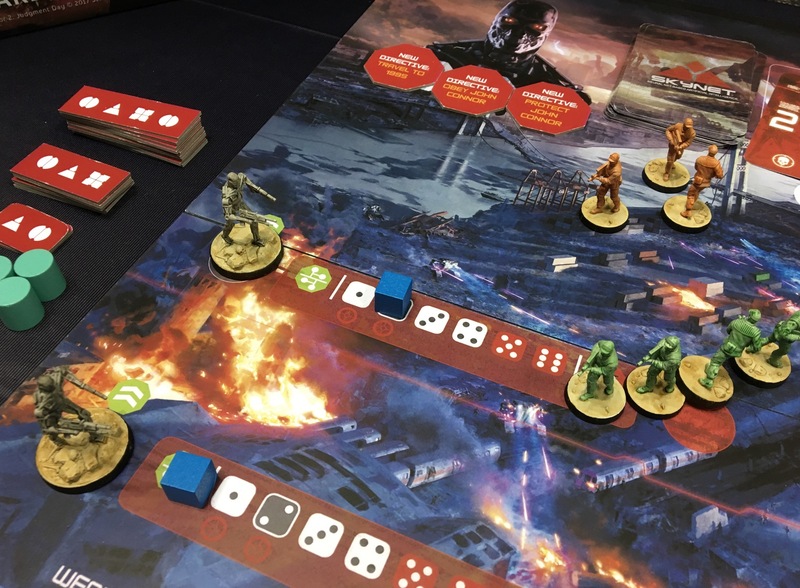 John Connor moves up the center of the board (mini between the white dice in the center) while his loyal soldiers keep the Terminators from advancing on their tracks towards John. There is also a mechanic for an airborne hunter-killer to attack and players can call upon Kyle Reese (he is in the truck with the cannon) to blast the bad guys. 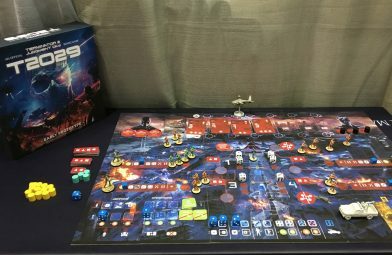 I am a fan of cooperative games and the theme is a personal favorite. The Kickstarter is scheduled to launch September 2017 with a March 2018 delivery date. 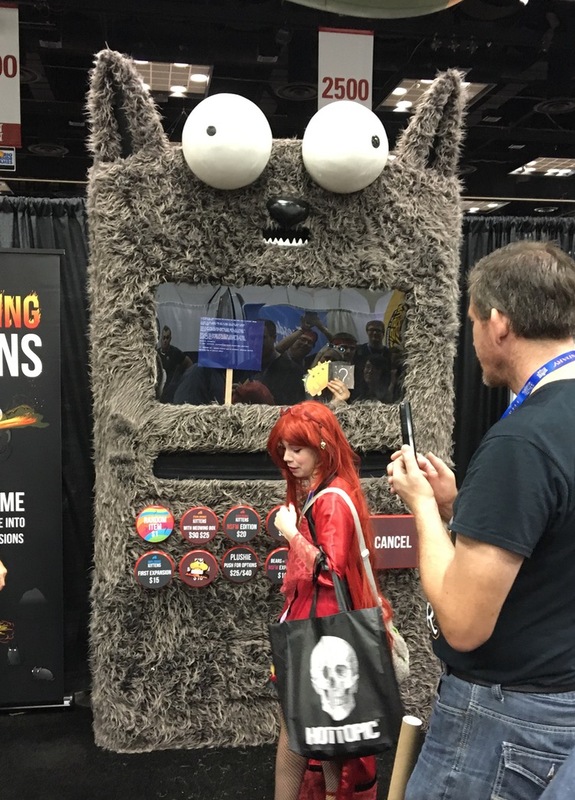 While I am not a fan of the game, “Exploding Kittens” ran the best vendor booth I have ever seen. You never interacted with a person, just this creepy cat kiosk. You hit the button for a product, inserted your money in the slot and the game spit out. They held up signs with snarky comments like “Purroccessing” and a “Blue Screen of Death.” People loitered just to see what would happen. Occasionally, the cat spat out completely random items after a transaction. 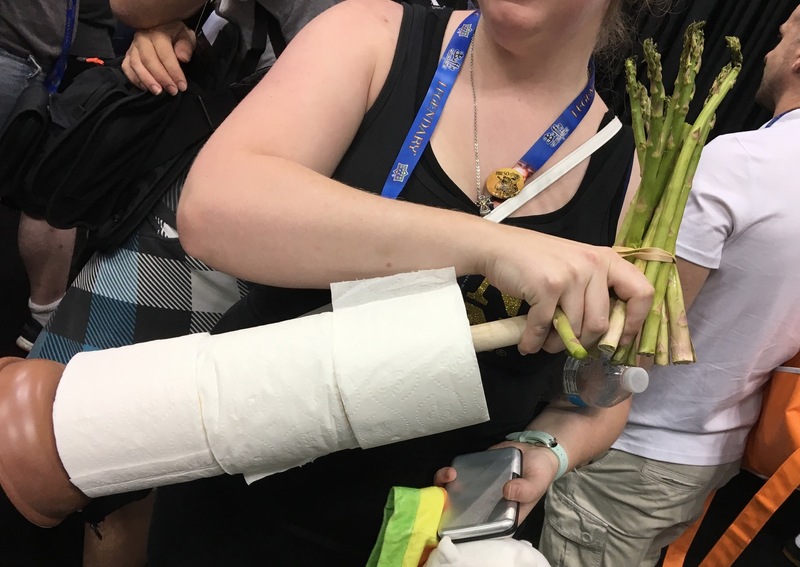 I have no idea how to interpret a plunger, toilet paper, and some fresh asparagus. Clever implementation and they likely made a ton of cash. 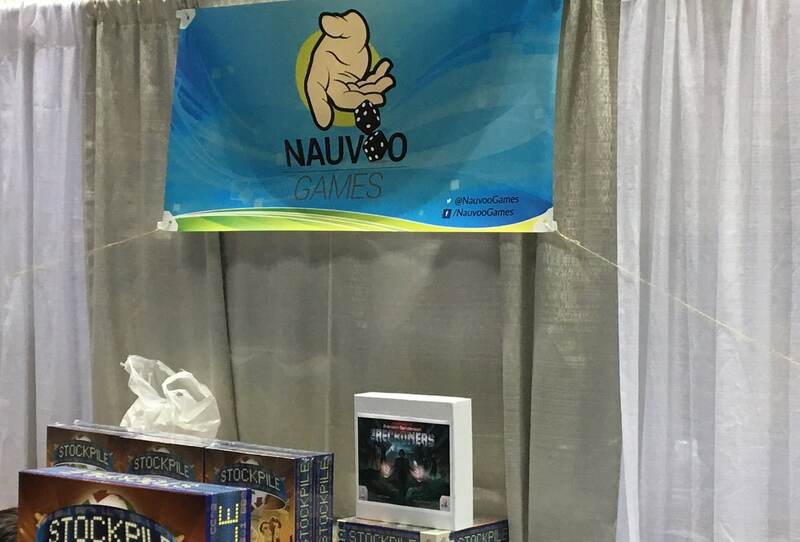 Not much to report yet, but Nauvoo has the license for “The Reckoners” series from Brandon Sanderson. “Reckoners” takes place in a world where super-heroes are all ruthless villains and subjugate humanity. “Reckoners” are human death squads that exploit a supers’ weakness (they all have a unique kryptonite) and the killing them. Fairly dark for a young adult book, but it was good fun and makes great fodder for a board game. I am looking forward to this Kickstarter. 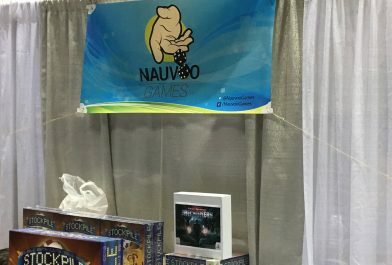 Several booths used the “blind buy” sales method. Basically, you buy a box/bag/container and it contains some pile of random, but guaranteed items (every bag has a Pop! mini, for example) and the chance to get something better if you get the right color ticket. These booths never made any sense to me as the random element means you have to just want themed “stuff” rather than a specific item. Not my cup of tea, but seemed popular. 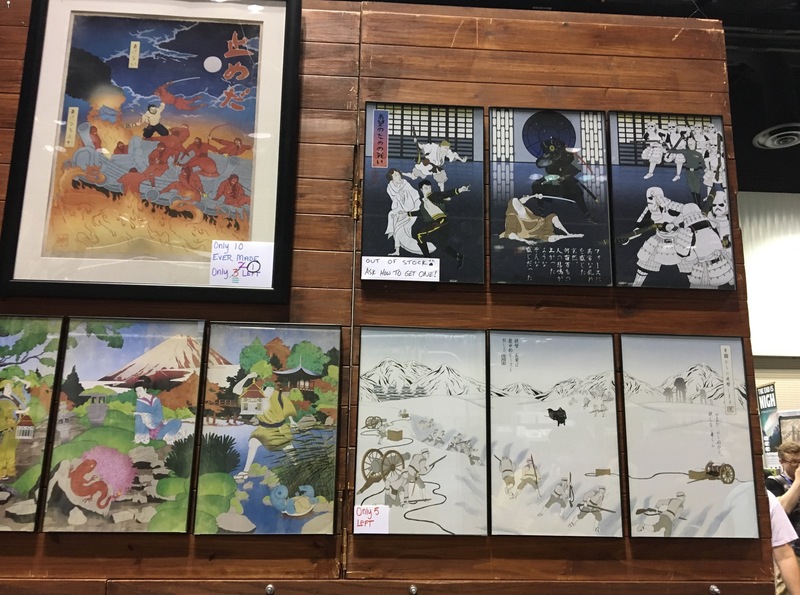 Artist BD Judkins produces a fascinating line of pop-culture infused traditional Japanese art. The triptych below is the “Battle of Hoth” and to the left is Pokemon circa 1750. 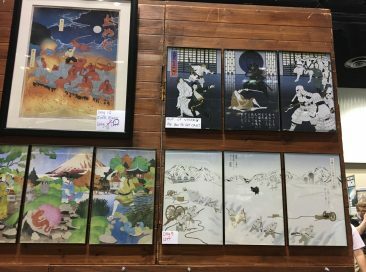 Amazing stuff and having seen many Ukiyo-e style artworks when I lived in Japan, these feel surprisingly authentic. While not an art fan, I am sorely tempted to order a couple of the Marvel ones. More vendor reports in part 3!